The researchers studied 16 people in four demographically and geographically diverse families, hailing from Oakland, Minneapolis, Baltimore, and Atlanta. Researchers tested participants for a select group of pesticides and their breakdown products in urine; working with independent laboratories to analyze urine samples, they found 14 different compounds that represented up to 40 different pesticides. After six days on the organic diet, overall pesticide levels dropped 60.5 percent in both the adults and children. The study provides important information to consumers who seek to limit their exposure to the hundreds of millions of pounds of pesticides and herbicides used in the U.S. today, say researchers. While the study reaffirms previous research, it also breaks new ground by testing for newer classes of pesticides that are now the most widely used in the U.S. today to kill insects, namely neonicotinoids and pyrethroids. Previous organic diet studies focused primarily on organophosphates, such as chlorpyrifos, an older class of pesticides with enough well-documented human toxicity results that some scientists recently called for a ban on all of them. “To date, we just don’t have enough information about these pesticides that are being used now, such as pyrethroids and neonicotinoids,” says lead author Carly Hyland, a doctoral student at the University of California. “There haven’t been enough large-scale studies.” The new study aimed in part to start building that knowledge base. The families the researchers chose represent a small but geographically and racially diverse group. Pesticide levels were tested in their urine for six days on a conventional diet, and then six days on an all-organic diet. Though the study group was small, a total of 158 urine samples were collected, which allowed for researchers to find statistical significance in the results—which Lanphear says makes it fairly robust. “I don’t have any doubt, given this study and others, that we wouldn’t expect to see similar reductions in pesticides in other populations,” he told Civil Eats. Chensheng Lu, a professor at Harvard University who led the Seattle organic diet study, agreed that the results have broader implications because of their consistency with previous research. “The major take-home message is very consistent,” he says. Organophosphates dropped the most, with a 70 percent overall reduction. Chlorpyrifos—which has been linked to increased rates of autism, learning disabilities, and reduced IQ in children—dropped 61 percent in participants, and malathion, a probable human carcinogen, dropped 95 percent. The U.S. Environmental Protection Agency (EPA) has not banned chlorpyrifos, despite its own scientists’ advice and a federal court order telling it to do so in August 2018. A U.S. appeals court last week agreed to hear the EPA’s case against banning the pesticide. The only herbicide included in the study, 2,4-D, dropped by 37 percent in the post-organic urine samples. The fifth most widely used pesticide in 2012 in the U.S. (the last year for which statistics are available) 2,4-D was an ingredient of the defoliant Agent Orange during the Vietnam War, and has been shown to have wide-ranging health impacts from endocrine disruption to liver damage to non-Hodgkin’s lymphoma. Glyphosate, the number one herbicide used today and the focus of a recent, landmark lawsuit against Bayer-Monsanto for the herbicide’s link to cancer, was not included in the study because laboratory methods for detecting it in humans are still in development, according to Hyland, although a number of studies have found the presence of glyphosate in foods on grocery shelves. “Glyphosate is a difficult compound to be analyzed” in humans, agreed Lu. Among the newer classes of pesticides studied, pyrethroid levels dropped overall by about 50 percent and the one neonicotinoid detected (out of two researchers set out to study) dropped by 84 percent. 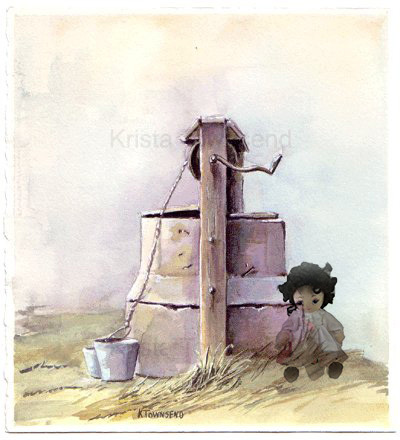 The other neonicotinoid wasn’t found in the urine samples. 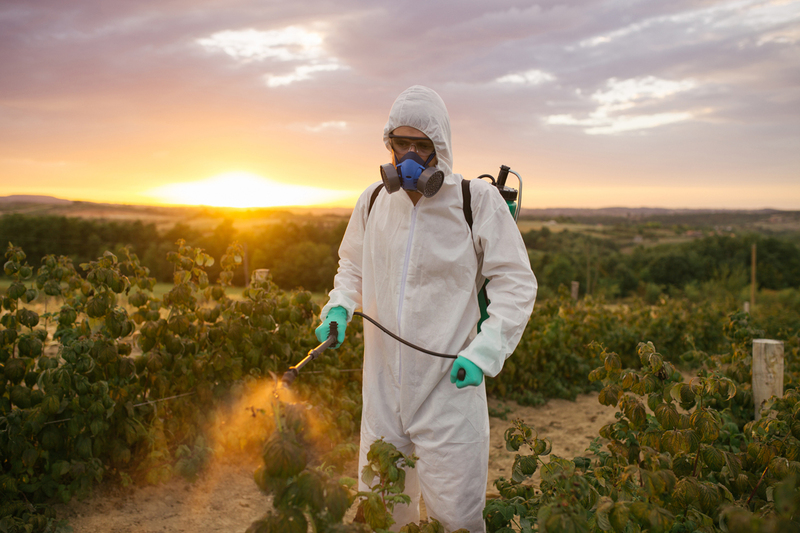 While the health impacts of the newer pesticides aren’t as well-studied, research to date suggests links to a range of neurodevelopmental, reproductive, immunological, and endocrine disorders. More is known about the environmental impact of neonicotinoids, which are thought to be a key contributor to colony collapse disorder in bees. Lu agreed. “I can almost predict that what happened to glyphosate will happen to neonicotinoids in the very near future,” he said, referring to the EPA’s repeated claims that the pesticide was safe, only to have the International Agency for Research on Cancer determine it to be potentially carcinogenic. Among major pesticide manufacturers, Dow Dupont declined the opportunity to comment on the implications of organic diet intervention studies, and Syngenta responded that they wouldn’t comment until they have had a chance to review the published study. In an effort to make organic food more widely available, Friends of the Earth is launching an advocacy campaign, Organic for All. Cost is one barrier for families to switch to organic food. Certified organic food on average costs 47 percent more than conventional food, according to Consumer Reports, though prices vary widely and in some cases organic may be cheaper. Retailers can also play a key role, says Klein, by requiring growers in their supply chains to phase out pesticides like chlorpyrifos and neonicotinoids. Costco took steps last June by encouraging all of its produce suppliers to phase out use of both those pesticides. Whole Foods has gone further, listing the pesticides that even its conventional growers can’t use because they are known to be harmful to pollinators or people. Hyland worries that consumers who are worried about the presence of pesticides in their bodies but can’t afford organic will stop eating fruits and vegetables and suggests that they take small steps, such as by avoiding members of the “dirty dozen” list of produce, such as apples and spinach, known to have heaviest levels of pesticide residues. Prior to the study, one of its participants from Atlanta, Boyd Baker, said he bought some organic items, like bananas or carrots, but that he didn’t buy a lot of organic. That was largely because it’s hard to find where he shops. A writer and producer of a live variety show, Baker does the majority of the shopping and cooking for his family, which includes his wife and two teenage children. 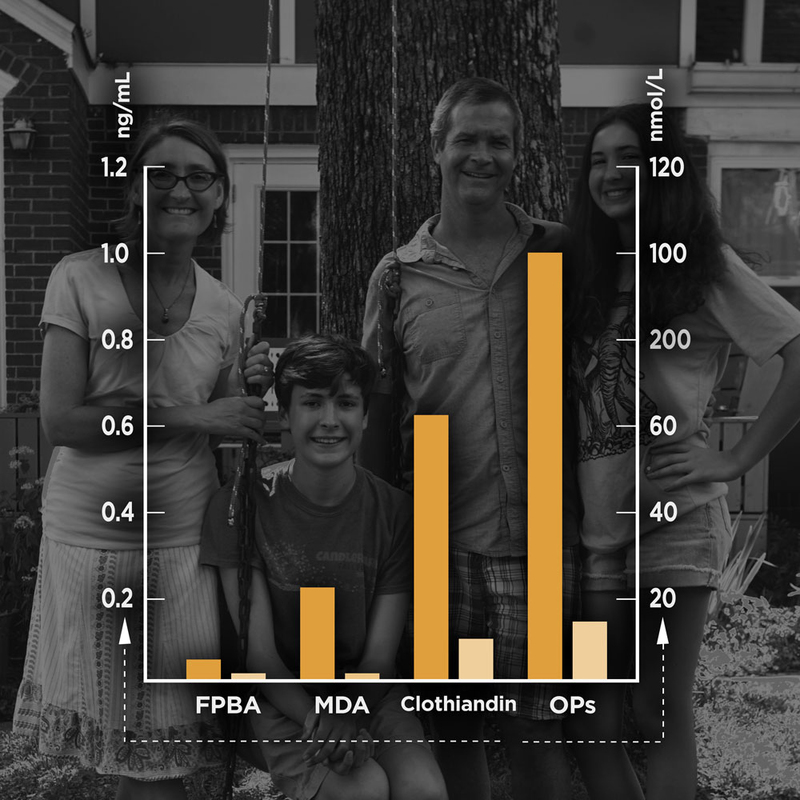 The pesticide residues present in the Boyd family’s urine samples while eating a conventional (dark orange) and organic (light orange) diet. Now, he adds, he doesn’t think twice about opting for organic foods in the grocery store, especially if the price difference isn’t large. “You can pay your farmer or you can pay your doctor,” says Baker.